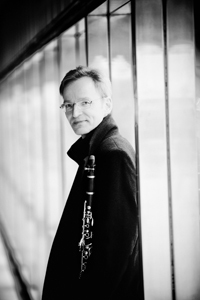 On September 8, 2010, Kari Kriikku gave the world première performance in Helsinki of Kaija Saariaho's clarinet concerto, 'D'OM LE VRAI SENS', with the Finnish Radio Symphony Orchestra under the baton of chief conductor Sakari Oramo. D'OM LE VRAI SENS brings together two of Finland's finest ambassadors of music, Kari Kriikku and Kaija Saariaho, two friends and regular collaborators. This is the first work Saariaho has written for solo clarinet and orchestra. The concerto will be recorded for a CD release by Ondine in 2011. Other co-commissioners with whom Kari Kriikku will première the work in the 2010/11 season are: BBC Symphony Orchestra and David Robertson; Orquestra Nacional do Porto (where Kaija Saariaho is featured as composer in residence) and John Storgårds; Swedish Radio Symphony Orchestra and John Storgårds; Orchestre Philharmonique de Radio France and Esa-Pekka Salonen (at the Présence Festival, Paris). In the composer's words, "the general idea of this piece is based on the famous medieval tapestries called La Dame à la Licorne [displayed at the Musée National du Moyen Âge in Paris]. The subject matter is the five senses and the 'sixth sense'. These six tapestries give their names to the six parts of the piece." A prolific champion of new music, and the recipient of the prestigious Nordic Music Council Prize in 2009, Kari Kriikku has inspired many native composers to write for him; Magnus Lindberg, whose concerto he last performed in March 2010 with the New York Philharmonic in Carnegie Hall under the baton of Alan Gilbert; Kimmo Hakola's colourful, mesmerising concerto which notably had fantastic performances under the baton of Semyon Bychkov both with WDR Köln and the orchestra of La Scala, Milan; Puro and Missa by Jukka Tiensuu have had an equally high level of exposure. A recording of Missa, with the Helsinki Philharmonic Orchestra and John Storgårds, the latest of Kriikku's extensive discography on the Ondine label, will be released in autumn 2010 (ODE 1166-2). The recording of Lindberg's Clarinet Concerto has received critical acclaim, not least a Gramophone Award and a BBC Music Magazine Award in 2006 (ODE 1038-2). For more information, in Finnish, visit the website of the Finnish Broadcasting Company YLE.